Enemy Coast Ahead: Attack on the Ennepe Dam? On May 17, 1943 a lone bomber codenamed AJ-O piloted by Flt. Sgt. Bill Townsend was circling the dark skies over Germany awaiting orders. In the early morning hours, the aircrew finally received the message they were waiting for. Their target was the Ennepe Dam. In the fog and darkness, the pilot and navigator finally arrived near what they thought was the Ennepe Dam and circled around to pinpoint it on the ground. 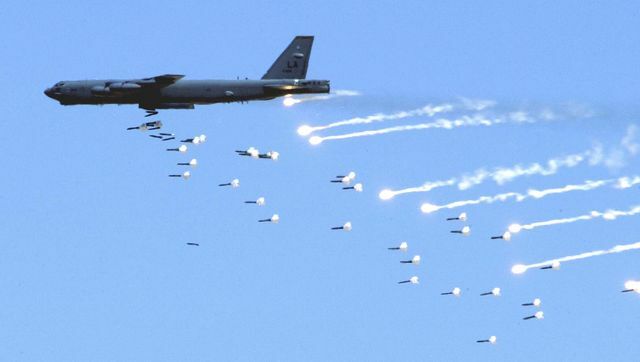 After making several passes to get the altitude and trajectory right, the custom-made dam-busting bomb codenamed "Upkeep" was finally dropped. With the other men of 617 already having made their bombing runs on the other dams in the Ruhr, Townsend decided to head home to England. 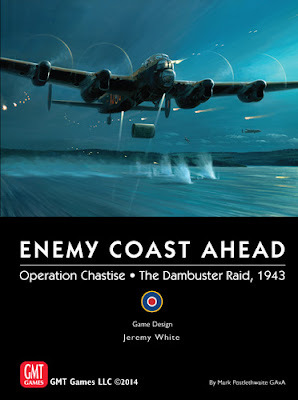 Enemy Coast Ahead (GMT, 2014) is a solitaire game designed by Jeremy White that simulates the RAF no. 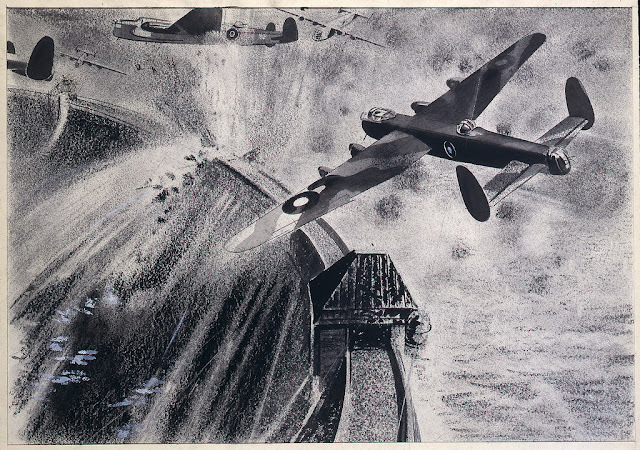 617 Squadron's May 1943 raids on German dams in the Ruhr. This game held a special interest for me because as a kid, I read Paul Brickhill's book and I remember being fascinated by the technical problems of the bomb design, the raid, and marshalling together the right men and training in secret to do something that had never ever been done before. Gulf Strike - Scenario 1: America - Heck Yeah! It's turn 7 of my latest game of Gulf Strike scenario 1 and Iran is doing terribly. It has taken us seven horrible turns of mucking around with supply problems to get down to the capital of Saudi Arabia and do battle with the Saudi forces protecting the capital. Along the east coast, a handful of Iranian units attempt to break the back of the lonesome small group of elite defenders protecting the Al Hufuh airbase from attack. Without supply or reinforcement, it seems they won't last much longer. On the other hand, the United States is now activated this turn and can start to get some serious units on to the table. At the beginning of the turn, we roll for a Random Political Event and get nothing at all. So we go ahead to the Global Military Stage and the US units start showing up at the bottom of the Strategic Map.